Multiple diseases and multiple medications can lead to some patients not following their medical regimens. Experts are examining why in an effort to help improve nonadherence rates that can reach 50% by some estimates. On-the-job learning, feedback, simulation, and deliberate practice can take a good clinician to the next level. Unwarranted testing and use of resources make up the biggest chunk of unnecessary health care costs, estimated at between $250 and $325 billion per year, and include such items as folic acid tests for patients with altered mental status, creatine kinase muscle-brain testing, and 24-hour patient observation after switching from IV to oral antibiotics. The FDA recommends that clinicians stop prescribing and dispensing combination drugs that contain more than 325 mg of acetaminophen per dose. A mentoring program pairs Alzheimer's patients with medical students to heighten students' awareness of the skills and strengths of Alzheimer's patients and familiarize them with related care and communication issues. ACP's incoming president reflects on the coming year, concerns about the future of internal medicine, and goals of the College. 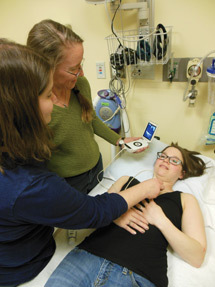 This issue includes stories about incorporating portable ultrasound into clinical care and about encouraging patients to fully comply with their prescription regimens. In recognition of their outstanding service, exceptional individuals received chapter awards in the winter and spring of 2014. Richard Dale Ruppert, MD, MACP, former president of the American Society of Internal Medicine (ASIM), died on Oct. 22, 2012, at the age of 81. A 62-year-old man undergoes a routine examination. He notes increasing fatigue of 8 months' duration but states he can perform his usual daily activities. He has no fever, night sweats, anorexia, or weight loss. The medical history is noncontributory, and he takes no medications. On physical examination, vital signs are normal. The spleen is palpable three finger breadths below the left midcostal margin. There is no lymphadenopathy or hepatomegaly. Following lab studies and a peripheral blood smear, what is the most appropriate management of the patient now?.